Was back from lunch today and I saw this. No, they are not commandos trying to save a damsel in distress or trying to snipe some terrorist in a building. 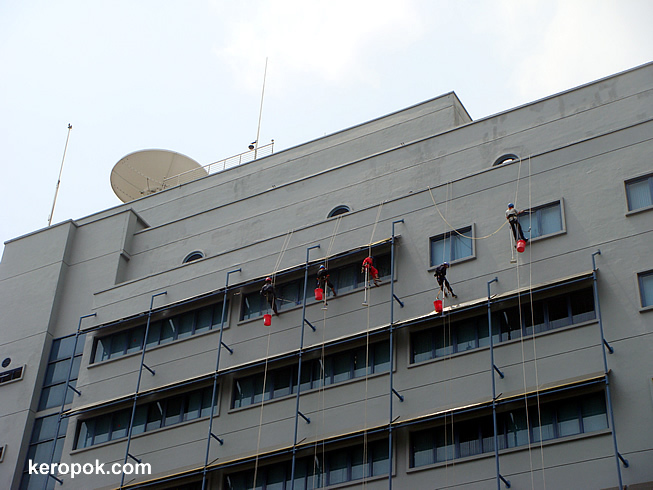 They are this group of workers from a cleaning company that is cleaning the facade of a building. Yes, they are enjoying every moment of it. You should watch them. Swinging around and spraying water at each other too! Yes, we can hear them sing too! These people must really love their work! I like my job, but I dont know if I like it that much. They are braver than I am. It is a tough job isn't it? A challenging and risky one as well. I like the type of work I do, computer programming, however I can not say I love my current work. It feels a little tedious at present ... I posted a similar photo of window washing a few years back. This pix reminds me instantly of Spider Man! Wonder what it's like to be swinging on the rope so high up the building! I love my work and I like very much this image. It is a nice post. I enjoyed it.